Why book the fake paparazzi / spoof paparazzi from the Pressmen. Our style and performance helps to get your party off to a great start. Guests love being treated as celebrities and not only does it put a smile on their faces but it really does create a warm atmosphere. As well as specialising in the fake paparazzi / spoof paparazzi side of performing we have made it our business to create our own unique brand of event photography. Our event photography is based on a candid reportage style. To catch those natural moments when guests are being themselves. The key to this type of photography is to create a good rapport with the guests, to take pictures at speed which requires state of the art DSLR cameras, and good photographic skills especially the quick framing and composing of a picture. We can deliver the pictures to our clients in a number of ways. Most people opt for a CD or DVD of their pictures which enables them to print as many photos as they like without any extra cost from us. We can also arrange to upload pictures to the web either as a special service to the client or on a site where guests will be able to buy the pictures of their choice. Another favourite option is for us to download our pictures to a computer and for a slide show to be shown during the event. When requested we do offer photobooks to tell the story of an event. 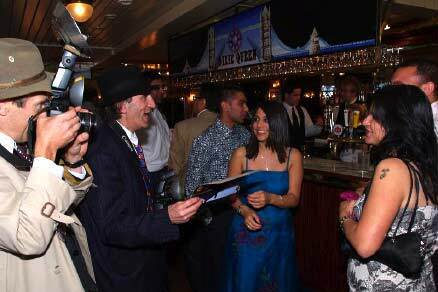 The Pressmen entertain your guests and tell the story of your event through photographs. The ultimate mixture of Fake/spoof paparazzi and event photography. We cover Corporate events, Birthday partys, Weddings, Bar Mitzvahs, Product Launches. Christmas Partys, Hollywood themed events, and much more as fake paparazzi.